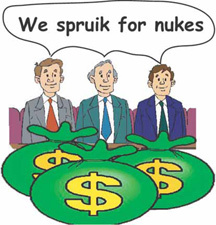 THE taxpayer has been handed a “catering” bill that is the equivalent of 45,000 cups of coffee, for a talkfest on nuclear energy. The catering bill for the so-called “Nuclear Fuel Cycle Royal Commission Consultation and Response Agency” was $182,580. The extraordinary cost is revealed in Freedom of Information documents released to the Opposition, which show the agency’s budget blew out by $400,000 to $7.6 million. It included $185,477 for media monitoring, $1.04 million for photography/AV and production, $152,373 for accommodation in South Australia, $256,771 for international and domestic travel, and $1.08 million spent on contractors. The agency’s brief was to sell the findings of the Royal Commission to the South Australian public — that nuclear energy generation was not feasible but a dump should be explored. Opposition treasury spokesman Rob Lucas said: “Taxpayers should be concerned about how their money was spent chasing the Weatherill Government’s nuclear thought bubble’’. Former Royal Commissioner Kevin Scarce distanced himself from the budget blowout and said it all happened after his watch. “The commission I led had no connection with CARA. CARA formed as the commission completed its work,’’ he said. The stated purpose of the agency was to: “Seek to understand the South Australian community’s perspectives on further involvement in the nuclear fuel cycle’’. Premier Jay Weatherill cut short the nuclear option for SA after the Opposition withdrew support for the idea. The agency comprised four prominent South Australians and included two“citizens’ juries” to discuss the Royal Commission findings. The second jury comprised 300 people randomly selected from the population, which could explain the large expenditure. A Government spokesman said the nuclear fuel cycle consultation was “the biggest in the state’s history” and the budget was publicly disclosed and “received bipartisan support”. “The Government makes no apologies for undertaking such an extensive consultation process to ensure all South Australians had the opportunity to have their say on this important matter,” he said.